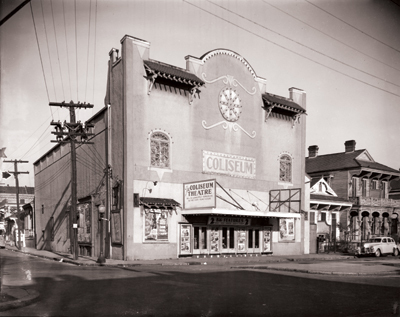 The Coliseum Theatre c. 1941. A 1925 renovation and expansion utilized a contractor’s ingenuity: The theater remained open while a larger building was constructed around it. A “Typhoon Cooling System” (air blown over ice to cool it) and other modern conveniences were installed|! !| and after a few days of closure to finalize things|! !| the theater reopened by hosting a live wedding|! !| followed by the film The Scarlet Honeymoon. Admission was 20-cents for adults and 10-cents for children. The first newspaper ads for the Coliseum Theater (sometimes appearing as “Theatre”) appeared in late 1913. The constantly rotating feature films and serials, as well as Sunday matinees, made it a popular addition to the neighborhood. Renovations in 1925 and ’36 modernized the theater, but the ’50 renovation changed the theater the most: All interior furnishings – seats, display cases and even the popcorn warmer – were sold and replaced with nicer versions; the seating capacity was enlarged with the addition of a balcony; air conditioning was added; and a soundproof “crying room” was created for mothers and their younger children. Throughout these renovations and future ones, the art deco light fixtures and features remained untouched. The Lazarus family owned and operated the theater from 1919 until the early ’60s, when United Theaters took over. When they announced they were going to close it, Al Viola leased it. Against all odds, he kept the Coliseum open until ’76, still offering double features for 75-cents for adults and 35-cents for kids – the lowest prices in the city. His secrets to success: keep expenses to a minimum, and be so friendly and accommodating that people will drive across town just to say hi and see a movie at your theater. The theater was offered for sale in mid-1975, and on April 20, ’76, it showed its last double feature: Planet of the Apes and Navy Vs. the Night Monsters, with a Mr. Magoo cartoon between. After the theater closed, the building was renovated into film and recording studios. The original façade and marquee, restored during those renovations, were damaged during Katrina. Just as those renovations were finishing, a fire destroyed the theater in February 2006.